This, like all the other ODTL reports, is a purely personal and subjective report of my experiences with the software and/or hardware in question. If you try this at home, your results may match mine exactly. Alternatively, following these steps might make the neighbor boy start sleeping with sheep, cause your toaster oven to become Internet-connected, (then be hacked by some kid in Pasadena who lights your house on fire with it), and finally, may turn your low fat milk sour and chunky just as you raise the carton to your lips. YMMV, Caution Advised. On December 9, I published an installation review of SuSE Linx 7.3 Professional. This was well received, and I'd also promised a review of SuSE's next generation system administration and configuration tool, YaST2. Yast2 is fairly well documented in the Configuration paper-bound book that accompanies the retail distribution, but the tool is straight forward and easy to use, with decent contextual help. Now is the time to examine YaST2. Enjoy! 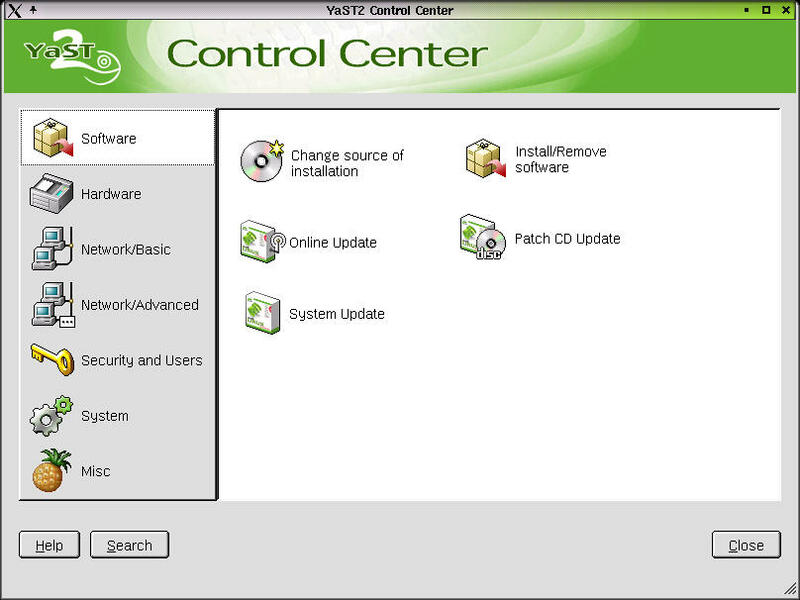 Yast2 is a fairly complete and competent tool for administering a SuSE installation. Why call it YaST? So far as I can tell, the name is an acronym for Yet Another Setup Tool (although I could be wrong). Of course, it's much more than that now. When starting YaST2, you're prompted first for the root user's password, for the level of permission necessary for the operations that are run. 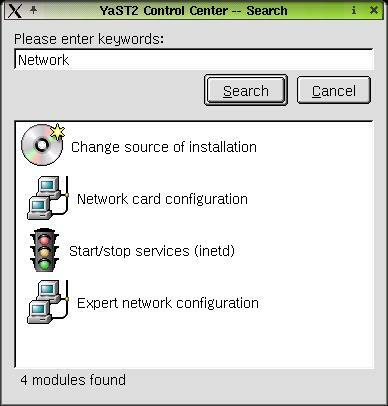 Then, as shown, there are seven major sections to YaST2: Software, Hardware, Network/Basic, Network/Advanced, Security and Users, System, and Miscellaneous. Let's have a look at each of these in turn. In a quick online search for YaST tricks and tips, I found that for all the various modules, simply pressing the PrintScreen key saves a PNG image of just the current dialog into the /tmp directory. How handy, especially for documenting what the settings were, before starting to make changes! But first, note that next to the Help button is one labeled Search. My first guess was that this provided a search facility to key into specific help topics faster. I was wrong. Search uses keywords to return matching module icon/links that cross the boundaries of the various sections in the YaST2 Control Center. For example, in the screenshot at right, the search word I used was Network. I was given four modules to choose from, in return. These are Change source of installation, Network card configuration, Start/stop services (inetd), and Expert network configuration. If I'm unfamiliar with YaST2, then this is a hand tool to find functions without having to search each section in turn. However, the index is pretty small. I'd expect to be able to type IP and have it return modules where I can change the IP address for the system. No such luck - nothing back on that one. Ah, well. Indexing is a tough chore. Change source of installation, Online Update, System Update, Install/Remove software and Patch CD Update. Autodetect Printers, Hardware Info, Scanner, TV cards, Edit Printers, Partitioner, Sound and X11 Configuration. ADSL, German T-DSL, Hostname and DNS, Modem configuration, Start/Stop services (inetd), ISDN configuration and Network Card Configuration. Configure NIS Server, NIS+ client, NIS client, LDAP client, NFS server, Sendmail configuration, Expert network configuration, NFS client and Routing. Edit and create groups (& Create a new group), Edit and create users (& Create a new user), Firewall Configuration and Security settings. Bootloader configuration, Configure boot mode, LVM, Runlevel editor, Select keyboard layout, Chose language, Create a boot, rescue or module floppy, RC-Config Editor, Select kernel and Select time zone. Load vendor driver CD, Post a support query, Printers in CUPS, Printers in LPD, View start-up log and View system log. 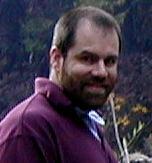 All Content Copyright © 1999-2001 Brian P. Bilbrey.